eek, over a month without a post. I haven't been sewing a lot (yet), but Eric and I have been making some cute food. I'll make myself feel better about not having much to post sewing wise by posting some of the cute meals. 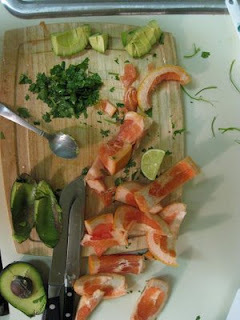 Peel grapefruit and, using a serrated knife, cut out individual sections so that no white pith remains. Set aside. Bring 1 1/4 cups of water to a boil in a medium saucepan. Add couscous, cover and remove from heat. Let stand 5 minutes, until liquid is absorbed. Meanwhile, heat oil in a large skillet over medium-high heat. Add green onions and garlic and cook 1 minute. Sprinkle in cumin and cook 1 minute, until fragrant. 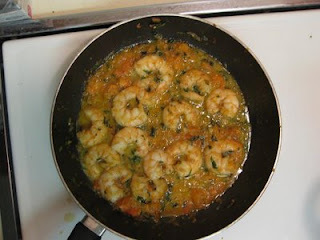 Add shrimp and cook 3 minutes, just until bright pink and cooked through, stirring frequently. Stir in grapefruit sections, cilantro, lime juice, salt and pepper. 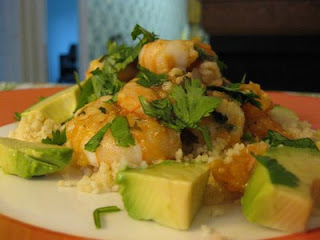 Transfer couscous to individual plates, top with shrimp mixture and garnish with avocado slices. Eric said this was GREAT and I believe it!